Last night, shortly after six p.m., Captain Kurt and Deckhand Haleigh welcomed guests aboard Tigress for a sunset sail. The night was warm, the sky was mostly clear, but streaked with a few clouds, the makings of the kind of sunset for which Martha’s Vineyard is famous. Captain Kurt does this almost every night during the summer months and to the naked eye, last night was a night just like any other—Captain Kurt and Haleigh welcoming guests aboard Tigress, in Edgartown Harbor; however, these guests were a little different than most. These guests, Chris Wedholm and his wife Pam, have been sailing with Kurt since the very beginning. Their first sail was August 8th, 2015. Last night was Chris and Pam’s fifth sail with the Captain and they’ve seen a lot of changes over the years. Photo: Captain Kurt and Chris’s son, Jack on that first sail August 8th, 2015. “I first saw Nantucket—Kurt’s first boat—through the lens of a high-powered telescope!” Chris says. 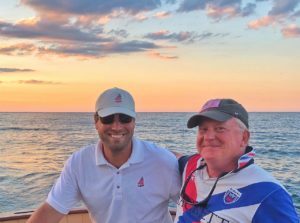 “We were staying on Chappaquiddick and my son and I saw this boat with an American Flag sail passing The Edgartown Light! In unison, we said, ‘Who is this guy?’” Chris laughs when he thinks about it now. Even from a distance, everything about Nantucket spoke to Chris and his family. 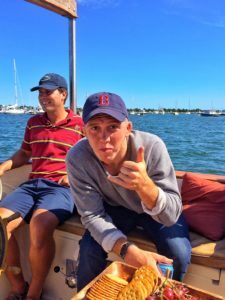 Chris grew up on Cape Cod, sailing his parents’ Beetle Cat and now, with a son at West Point Military Academy, Kurt’s custom sail touched them all. We’re deep into our fourth season now, and more and more, we are seeing familiar faces. People are making a point of including Catboat Charters in their vacation plans and we can’t tell you how much that means to us. Chris, Pam, Harley, and Jack, and their friends are everything that Catboat Charters and Captain Kurt believe in. Chris and Pam are very proud parents and they love sharing their lives with good friends. Positive energy begets positive energy. We’re grateful to have them in The Catboat Charters Family.